I would like to help on one thing. I want to put a banner on my blog. similar to what I did this: bodyboardingtv.com.br/, but can not. @Anderson: plz , do you explan us how post redtube on blogger tube , anderson? @Abu Farhan: hello i need help. the video player is not showing o the page…what to do? 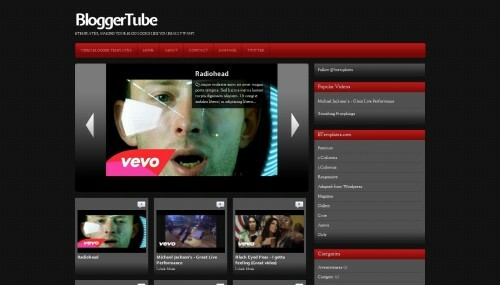 wow,This is a nice template for video blogs. Fantastique, your work is fabulous. I like very much. Thanks! The EasySlider scrip at this template seems to have stopped working, even in the demo here at Btamplates. I suspect it may be due to some sort of bug/problem with the hosting of the script at Btemplates, since the script apparently stopped working everywhere. Is there a way to fix it here?! Or, can anybody let me know how to host the script mayself?! I tried doing it via 4shared, but seems I’m doing something wrong (dunno if I need to install the script, or get the url right). @Houston: If you already installed the template, you’ll see that you can change the title of your blog in Settings/Basic. se me complica con este templete porque tiene muchas carpetas. SI ALGUIEN ME PUEDE AYUDAR, SE LOS AGRADECERIA DE CORAZÓN. I compounded this shrine because it has many folders. IF ANYONE CAN HELP ME, HEART they are grateful. @marcelino You can find the answer to your questions and more in our FAQ section. to see if you help me. NB:If you get trouble with slider, see Abu Farhan’s links..
gostaria de sua ajuda, já enviei e-mail p/ você mai não tive resposta. mais não consigo sempre da erro no html. gostaria de saber de como trocar o templates de meu blog. yep, just tried it, and it works… not very flexible though…. a template for artists which are active in more than one field – like me – in music, photography and poetry would be great… how can i add mp3 to a blogger web page template? Thanks for giving so nice and unique template for youtube collection but in this template I m not able to create a static page. Olá, estou com problemas com este template, o slideshow nao consigo faze-lo funcionar por favor me ajude. Meu slide não funciona tambem! Ja tentei de tudo! Hi. Right now I’m planning a new blogs about Health Videos but not only from YouTube. It’ll be great if you can put in soon the same template but allowing to include videos from any website. THANKS A LOT!!! how can i make slideshow ? Please help in any way !!! @rohmat: i found it and i have read it, but it isnt auto thumbnails. Gracias por la plantilla muy buena! Aunque yo me tomado la molestia de modificar el código de youtube por megavideo va perfecto! @lukas: Lukas, me podrías decir cómo has cargado la plantilla? I think some changes are essential for my site. anybody knows how to add “like” share fb twitter buttons for posts?? ?